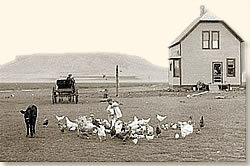 When America entered the twentieth century, almost half of its population lived on a farm (compared with approximately one percent in the year 2000). It was a hard life. There was little industrialization to help with the chores and no electricity to illuminate the darkness. 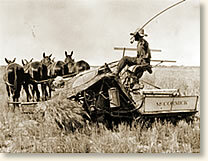 The majority of farms were family-run, providing subsistence and hopefully an income through the sale of any surplus. "I am not a practical woman." "I have been a farmer's wife in one of the States of the Middle West for thirteen years, and everybody knows that the farmer's wife must of a necessity be a very practical woman, if she would be a successful one. I am not a practical woman and consequently have been accounted a failure by practical friends and especially by my husband, who is wholly practical. We are told that the mating of people of opposite natures promotes intellectuality in the offspring; but I think that happy homes are of more consequence than extreme precocity of children. However, I believe that people who are thinking of mating do not even consider whether it is to be the one or the other. We do know that when people of opposite tastes get married there's a discordant note runs through their entire married life. It’s only a question of which one has the stronger will in determining which tastes shall predom­inate. In our case my husband has the stronger will; he is innocent of book learning, is a natural hustler who believes that the only way to make an honest living lies in digging it out of the ground, so to speak, and being a farmer, he finds plenty of digging to do; he has an inherited tendency to be miserly, loves money for its own sake rather than for its purchasing power, and when he has it in his possession he is loath to part with it, even for the most necessary articles, and prefers to eschew hired help in every possible instance that what he does make may be his very own. No man can run a farm without some one to help him, and in this case I have always been called upon and expected to help do anything that a man would be expected to do; I began this when we were first married, when there were few household duties and no reasonable excuse for refusing to help. I was reared on a farm, was healthy and strong, was ambitious, and the work was not disagreeable, and having no children for the first six years of married life, the habit of going whenever asked to became firmly fixed, and he had no thought of hiring a man to help him, since I could do anything for which he needed help.
. . . I was an apt student at school and before I was eighteen I had earned a teacher's certificate of the second grade and would gladly have remained in school a few more years, but I had, unwittingly, agreed to marry the man who is now my husband, and though I begged to be released, his will was so much stronger that I was unable to free myself without wounding a loving heart, and could not find it in my nature to do so.
. . . Later, when I was married, I borrowed everything I could find in the line of novels and stories, and read them by stealth still, for my husband thought it a willful waste of time to read anything and that it showed a lack of love for him if I would rather read than to talk to him when I had a few moments of leisure, and, in order to avoid giving offense and still gratify my desire, I would only read when he was not at the house, thereby greatly curtailing my already too limited reading hours.
. . . It is only during the last three years that I have had the news to read, for my husband is so very penurious that he would never consent to subscribing for papers of any kind and that old habit of avoiding that which would give offense was so fixed that I did not dare to break it.
. . . This is a vague, general idea of how I spend my time; my work is so varied that it would be difficult, indeed, to describe a typical day's work. Any bright morning in the latter part of May I am out of bed at four o'clock; next, after I have dressed and combed my hair, I start a fire in the kitchen stove, and while the stove is getting hot I go to my flower garden and gather a choice, half-blown rose and a spray of bride's wreath, and arrange them in my hair, and sweep the floors and then cook breakfast. While the other members of the family are eating breakfast I strain away the morning's milk (for my husband milks the cows while I get breakfast), and fill my husband's dinner pail, for he will go to work on our other farm for the day. By this time it is half-past five o'clock, my husband is gone to his work, and the stock loudly pleading to be turned into the pastures. The younger cattle, a half-dozen steers, are left in the pasture at night, and I now drive the two cows, a half-quarter mile and turn them in with the others, come back, and then there's a horse in the barn that be­longs in a field where there is no water, which I take to a spring quite a distance from the barn; bring it back and turn it into a field with the sheep, a dozen in number, which are housed at night. The young calves are then turned out into the warm sunshine, and the stock hogs, which are kept in a pen, are clamoring for feed, and I carry a pailful of swill to them, and hasten to the house and turn out the chickens and put out feed and water for them, and it is, perhaps, 6.30 A..M.
I have not eaten breakfast yet, but that can wait; I make the beds next and straighten things up in the living room, for I dislike to have the early morning caller find my house topsy-turvy. When this is done I go to the kitchen, which also serves as a dining-room, and uncover the table, and take a mouthful of food occasionally as I pass to and fro at my work until my appetite is appeased. By the time the work is done in the kitchen it is about 7.15 A. M., and the cool morning hours have flown, and no hoeing done in the garden yet, and the children's toilet has to be attended to and churning has to be done. Finally the children are washed and churning done, and it is eight o'clock, and the sun getting hot, but no matter, weeds die quickly when cut down in the heat of the day, and I use the hoe to a good advantage until the din­ner hour, which is 11.30 A. M. We come in, and I comb my hair, and put fresh flowers in it, and eat a cold dinner, put out feed and water for the chickens; set a hen, perhaps, sweep the floors again; sit down and rest, and read a few moments, and it is nearly one 0' clock, and I sweep the door yard while I am waiting for the clock to strike the hour. I make and sow a flower bed, dig around some shrubbery, and go back to the garden to hoe until time to do the chores at night, but ere long some hogs come up to the back gate, through the wheat field, and when I go to see what is wrong I find that the cows have torn the fence down, and they, too, are in the wheat field. With much difficulty I get them back into their own domain and repair the fence. I hoe in the garden till four o'clock; then I go into the house and get supper, and prepare some­thing for the dinner pail to-morrow; when supper is all ready it is set aside, and I pull a few hundred plants of tomato, sweet potato or cabbage for transplanting, set them in a cool, moist place where they will not wilt, and I then go after the horse, water him, and put him in the barn; call the sheep and house them, and go after the cows and milk them, feed the hogs, put down hay for three horses, and put oats and corn in their troughs, and set those plants and come in and fasten up the chickens, and it is dark. By this time it is 8 o'clock P. M.; my husband has come home, and we are eating supper; when we are through eating I make the beds ready, and the children and their father go to bed, and I wash the dishes and get things in shape to get breakfast quickly next morning. It is now about 9 o'clock P. M., and after a short prayer I retire for the night." This eyewitness account appears in: Holt, Hamilton, The Life Stories of Undistinguished Americans as Told by Themselves (1906). 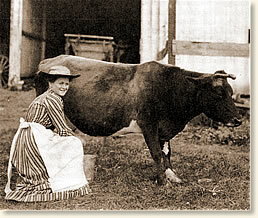 "Farm Wife, 1900" EyeWitness to History, www.eyewitnesstohistory.com (2007).